As most chess players may know, every piece on the board is basically safe if it isn’t in one of the unique movement paths of an enemy piece, or in a pawn’s capture path. This is definitely not true if all the pieces have crude, futuristic firearms, though. 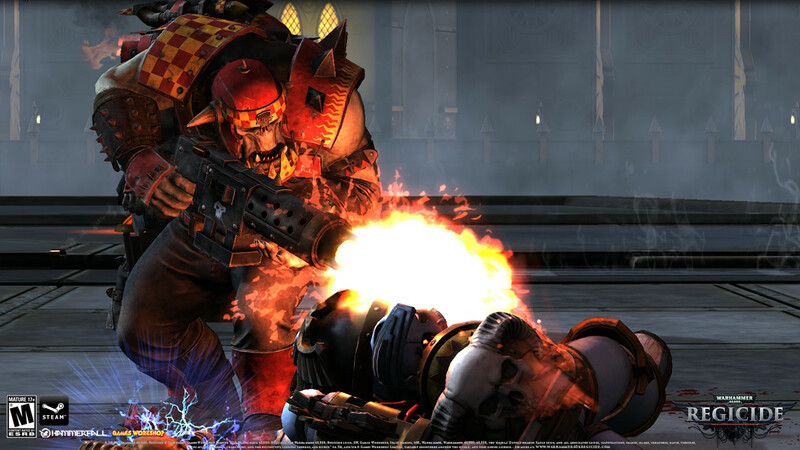 To describe Warhammer 40,000: Regicide as quickly as possible is easy: it’s battle chess with guns. To explain the significance of this and what being able to shoot another piece on a chessboard means for strategy, however, is a bit more complicated. First of all, capturing an enemy piece in Regicide involves a skippable and excessively gory murder animation. Then there are the RPG elements which allow players to level up their profiles and gain access to different special abilities as well as eventual improvements to their chess pieces. In many ways, developer Hammerfall Publishing has succeeded in making chess more exciting. Granted, it took some strategy RPG elements, a surplus of testosterone, a well-established game series’ rich, ever-growing lore, and Gears of War-levels of gibs and blood to make that happen. 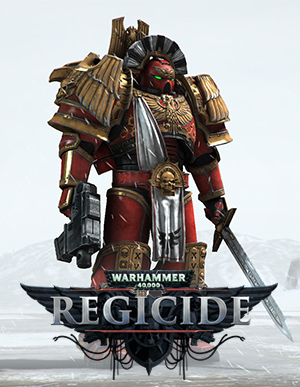 But as a result, Warhammer 40,000: Regicide is not quite chess and not quite Warhammer. In Regicide, players can either play locally or against an AI via the Skirmish game mode, or online against people. There are two game types: Classic, which is just chess with murder animations, and Regicide, which is a bit more. For the most part, Regicide mode is still very much like chess. At the beginning of a Regicide match, the game board looks identical to chess. The board is the same size, it has the same amount of tiles, and the same types of pieces with the same movement rules. This is Warhammer though, so players have the choice of either using Orks or Space Marines. Each piece has a unique name and is part of a unit class, so an Ork “Weirdboy” is a queen and a Space Marine “Terminator” is a rook. Like chess, it’s still turn-based and killing the enemy king is still necessary for victory. But Regicide mode is chess where the pieces can shoot at each other from a distance. Every turn is divided into two phases: Movement Phase and Initiative Phase. Movement Phase plays out exactly like chess, the player must move one unit and is not allowed to move their king into check. Initiative Phase follows immediately after and is usually where the game gets interesting. At the beginning of Initiative Phase, the player gets three Initiative Points (or IP) that cap at five. Every unit has a range of different abilities for use during the Initiative Phase, each costing Initiative Points to use. These abilities have cooldowns and range from a general aim-and-shoot attack called “Snap Shot”, to more unique abilities like area buffs, debuffs, force fields, explosives, and psychic strikes. The player also has access to four equippable abilities which also cost IP, these can involve healing a unit, making a unit invisible, or even preventing an area of enemy units from doing anything during the opponent’s Initiative Phase. Each chess piece has their own stats, including HP, which contribute to their attack accuracy, damage, and defenses. Needless to say, killing is much easier in Regicide than in chess. For example, a player using Orks can move a rook right into the movement range of an enemy bishop, then activate the Ork rook’s unique ability to vastly increase critical hit chance and follow it by firing several high-caliber rounds into the enemy piece. Given the right circumstances, this move can effectively kill the bishop that same turn. Winning isn’t just about getting checkmate; in many cases, it may be smarter to just murder the enemy king with a machine gun. The guns and abilities make the game much less predictable than a round of chess. This can be good and bad. At any given moment, it’s possible for a long-winding strategy to get overturned by a critical hit, and that can even escalate into a full-on killing spree in the opposite direction. In that scenario though, that turnaround happened almost entirely thanks to luck. You see, the Orks and Space Marines have different stat distributions and different abilities. Orks have far more HP, and can hit harder. However, Orks have a lower hit chance than Space Marines and also less armor. Meanwhile, Space Marines are more well-rounded, they have lower HP, but more armor and accuracy. Balancing these factions must have been a difficult task, especially since they don’t always seem balanced. Given their different strengths and weaknesses, the two factions encourage different styles of plays. In an Ork vs Space Marine game, Orks work better for risk-taking and assault, while Space Marines would want to hang back and get some shots in from a distance. But since most abilities have a hit chance, hitting anything with the vast majority of actions players can take during the Initiative Phase is at the mercy of the game’s random number generator (or RNG). This means players can go entire turns without landing a single hit, despite each unit’s hit chance. It isn’t too uncommon to see attacks with a 90% chance of hitting to miss either. But this also means it’s possible to go a few turns without missing a shot. While this is an inherent factor of turn-based strategy, it also fails to truly blend with something as precise as chess. The chessboard is small so a single miss holds more tactical significance than usual. The Initiative Phase adds actual risk and reward to the strategy behind every match, and tries to balance between unpredictable and too unpredictable. Players’ experiences may vary heavily as a result, and on some occasions, it may not even seem fair. The different unit stats are also a bit questionable. 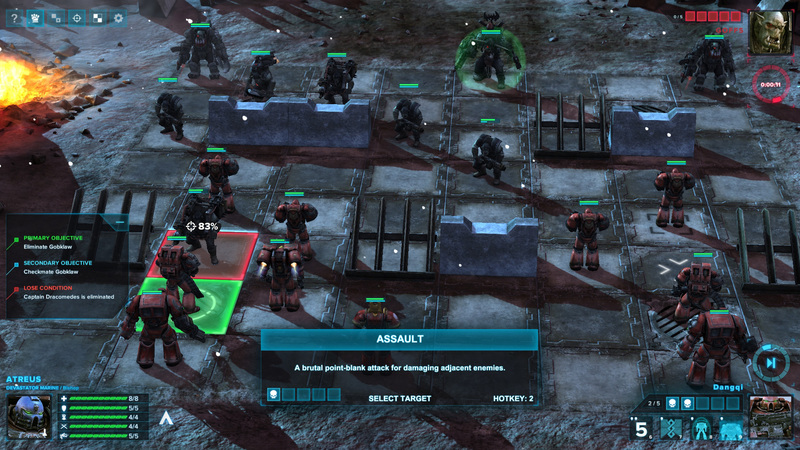 At their base levels, an Ork rook has twice as much HP as its Space Marine counterpart and does more damage per hit. Though units can level up, playing Orks is generally easier as a result. Orks may miss more often overall than Space Marines, but this is hardly always the case at a per-match basis. When Orks hit harder anyway, playing as Orks may not be a strategic advantage but an RNG one. At times, this is partially remedied by how armor and damage reductions works. Units have two stats that contribute to damage reduction: Armor and Toughness. While it may seem overly complex, units can lose armor upon taking damage but not toughness. This means that units can still benefit from the “Go To Ground” ability which increases toughness, even if they have no armor. In other words, Space Marines are arguably at an advantage over Orks late-match, but this again doesn’t matter if they miss – which they often do. It is not to say Orks are better than Space Marines and that there is a concrete balance problem. Rather, it is more an issue of the game Regicide is meant to be. RNG-based hit chances, turn-based strategy, and RPG stat distributions are often accompanied by movement, space, and terrain factors that chess does not provide. This makes luck slightly too big of a factor in how a match goes down. For those who want a break from the chess-centric nature of an online or offline Skirmish, there’s the varied fifty-mission story campaign. The campaign features a simple story that’s divided into three acts and follows the elite Blood Angels faction of Space Marines as they battle through the Ork forces on planet Hethgar Prime. Story is served to the player at the beginning of each mission in the form of a scrolling exchange of voiced chatter between characters. There is the occasional pre-rendered cutscene in each act, but the campaign is clearly more about the challenge present in each mission rather than its context. That isn’t to say the voice-acting and writing don’t do a great job in representing what people would want from an in-universe Warhammer 40,000 game story — it does. 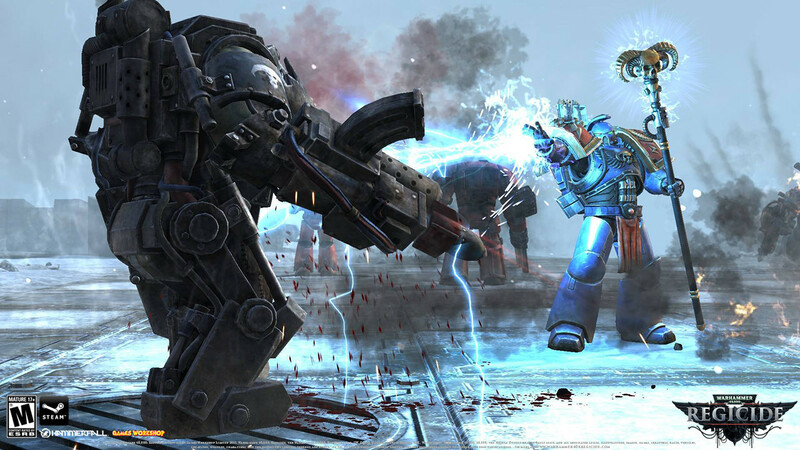 The Space Marines are consistently intense all the time and sound spectacularly like the kind of manly-man who would not only be a space marine literally called “a Space Marine,” but also one that fights Orks in a sci-fi universe. More importantly, though, the campaign missions themselves succeed in offering some stiff challenges that also educate players on game mechanics, different scenarios and possible maneuvers. The missions each have their own specific configurations of units and scenarios. So instead of a chess match, each mission gives players a specific set up on the board, along with a main objective, a secondary objective and a failure condition. Players gain EXP at the end of a campaign mission which goes towards their profile level, and a good chunk of bonus EXP for completing the often extra-hard secondary objectives. 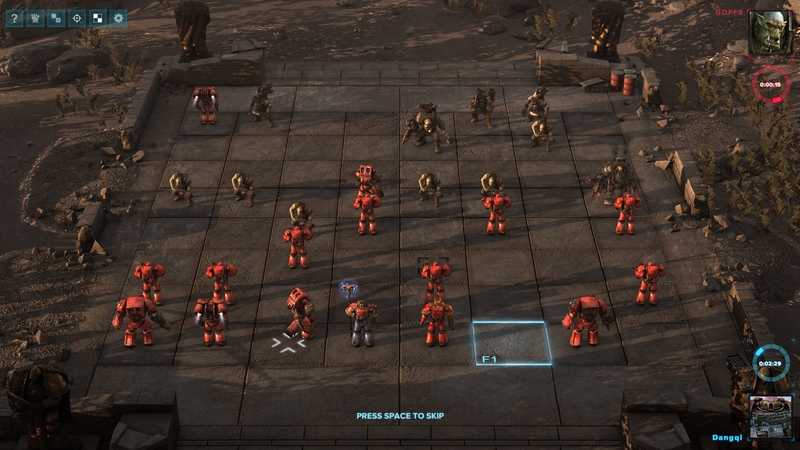 Unfortunately, the campaign has the player using Space Marines for its many creative but difficult challenges. Players who want to test themselves using Orks are better off just playing through Skirmishes. On the brightside, players are more likely to leave the campaign smarter and better at the game than before, thanks to how challenging the missions get by the second act. Originally a Steam Early Access game, Regicide doesn’t have a long list of features to begin with, even if more are added in future updates. While the voice-acting is enthusiastic and consistent, there is little variety to what units say outside of the campaign. Music variety is even worse and usually sounds bland, if tonally accurate. Visually, Regicide is a Unity Engine game and nicely looks the part. At max settings, it has some detailed textures that hold up on closeups, along with a few shiny particle effects. The blood and gibs are as good as they should be, and every murder animation is neat to behold at first. There isn’t anything particularly notable about the sets and environments, though, since they aren’t meant to stand out. The graphical options are limited as well. As a Unity Engine game, it only has one overall option for graphical quality and an anti-aliasing setting that goes up to 8x. There have been a few UI bugs which thankfully aren’t consistent, and players who like to skip animations – as most will after a few rounds – may experience a few minor hitches and stutters as the game jumps to the end-state of a move. Online match-making can be a mixed bag. At times, hopping into a game is quick, and other times, it either doesn’t happen or takes forever. There isn’t any chat support during online matches, which is a bit odd given the Steam and Friends List integration in the game’s main menu UI. 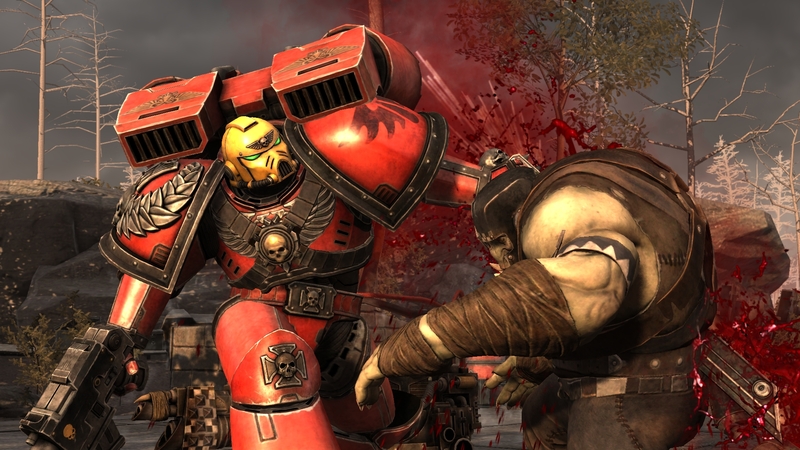 It isn’t easy to recommend Warhammer 40,000: Regicide since it is in many ways it’s own thing. Some people who enjoy chess may not like the unpredictability inherent in the non-chess parts of Regicide, while turn-based strategy fans may not enjoy the restrictions presented by still being on a chessboard and following all of chess’ movement rules. Though its strategy-RPG elements can overshadow the chess part of the game, it doesn’t change the fact that a chess capture is an instant kill. Regicide can make players feel far more capable than chess allows, but also occasionally powerless. Those who find comfort and excitement in Regicide’s middle ground, though, will have the joy of experiencing the strategic depth and twists its scrutinized balance and flexibility can offer.